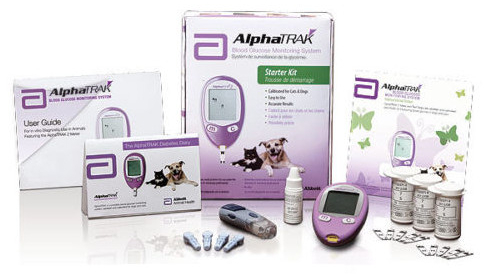 The AlphaTRAK 2 is an accurate, easy to use way of monitoring your pet's blood glucose from home while using the same accurate device that your vet will use. The meter is specifically for dogs and cats, and only requires a tiny blood sample which provides results in seconds. The AlphaTRAK 2 is available from VioVet as a starter kit which provides all you need to get fast results without the high vet bills. 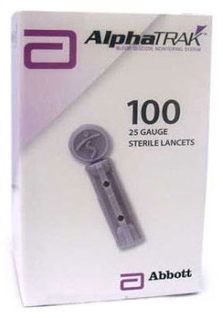 We also supply spare test strips and lancets to allow you to keep testing without having to by another full kit. The goal of pet diabetes management is to control glucose levels and minimise complications. Blood glucose monitoring is a way to assess the diabetes treatment plan and make adjustments, if needed. Blood glucose monitoring at home allows you to measure your pet’s glucose levels when they are experiencing their regular daily routine. This provides your vet with accurate data to help assess the treatment plan. So, why specifically AlphaTRAK 2? Humans, dogs, and cats all have different make-ups of blood, specifically the difference in the ratios of glucose in plasma and red blood cells. While dogs have 87.5% of glucose in plasma and cats have 93%, humans only have 58%. This is significantly lower. If you use a human meter on a dog or cat, it assumes human glucose distribution in blood to calculate glucose levels, which may result in underestimation of blood glucose concentrations and inaccurate readings. 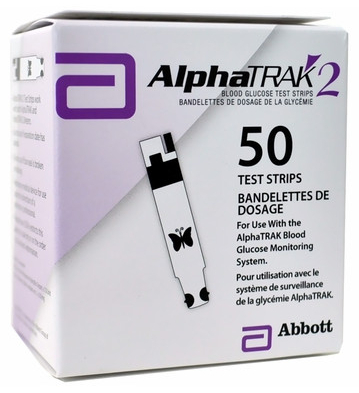 AlphaTRAK 2 Test Strips are for use with the AlphaTRAK glucose monitoring systems designed specifically for cats and dogs. These new strips have an improved design with an angled sample area that makes it easier to position the target area to the blood drop for fast wicking. 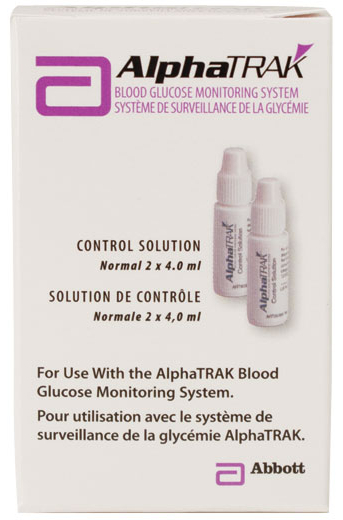 AlphaTRAK 2 Lancets are for use with the AlphaTRAK glucose monitoring systems designed specifically for cats and dogs. Designed to be safe and sterile, the spare lancets are tiny needles that are used to prick the skin and draw small amounts of blood for testing. Below are some recent questions we've received regarding AlphaTRAK 2, including answers from our team. No you do not require a new bottle of control solution with a new pack of test strips. You can continue to use the same bottle until it runs out or has reached its expiry date.